⛷️From 4-7th we'll be up in the snowy Dolomites for the Unplug.vc winter retreat, with lots of crypto people. Super pumped, look out for some pics on Twitter! The big news of the week is that the SEC has been (not so) quietly turning up the pressure over the past few weeks and months: it was reported that up to 80 companies and individuals on both coasts have received subpoenas and information requests in relation to their involvement with ICOs and pre-sales, and not just the issuers but also advisors, law firms, exchanges and investors. Remember that angry (now deleted) Twitter rant from Mike Arrington? Yep, he got one. "I believe that gatekeepers and others, including securities lawyers, accountants and consultants, need to focus on their responsibilities. I have urged these professionals to be guided by the principal motivation for our registration, offering process and disclosure requirements: investor protection and, in particular, the protection of our Main Street investors"
This frankly should come at no surprise to most industry insiders, as the SEC has been ringing the alarm bell for quite some time now (the DAO Report dates June 2017) and taken selected enforcement actions already (e.g. Munchee, AriseBank). 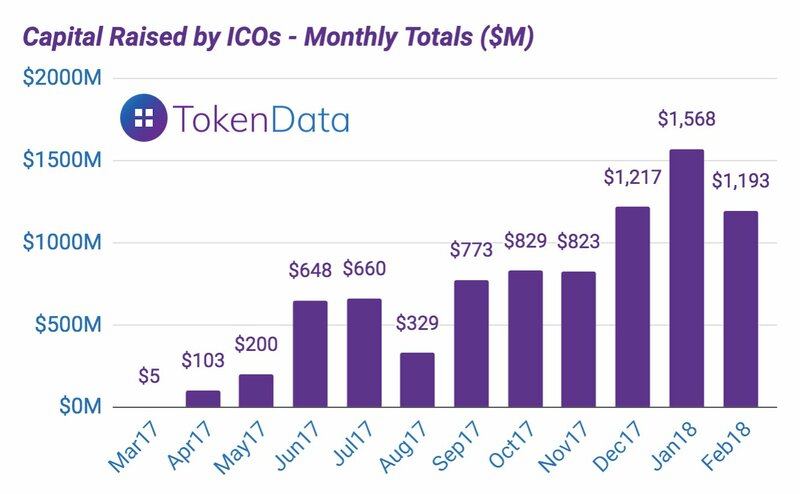 Many projects got cold feet as a result, which is probably why we've experienced such a dramatic drop in public ICOs recently (with money piling in private rounds). Perhaps what's unprecedented is how broadly and deeply the sweep seems to be extending, going well beyond the issuers themselves with 25-page documents requesting "every bit of communication around the token launch." For now the SEC is gathering information and quite possibly using the subpoena tool to cool off the market, while taking select enforcement actions. We'll now have to wait and see what comes next to judge the ultimate impact of the sweep. Like it or not though, the wave of regulated ICOs / security tokens and exchanges is upon us. We should also expect decentralized exchanges to pick up some of the slack from their centralized versions that will likely be forced to delist tokens, while others will just die off of illiquidity or protracted litigation. Alternative jurisdictions like Switzerland (whose regulator has just stated some utility tokens do not fall under security regulations) should see increased popularity with founders. One of the companies under SEC investigation is publicly listed Overstock, just fresh from closing a $100m pre-sale for its tZero alternative trading system subsidiary, and obviously already in the middle of another raise (because you know, $100m ain't quite enough). Its market cap dropped by about $150m (c. 10%) since the news broke. Huge M&A news this week, as the rumours circulated a couple of weeks ago of Circle's acquisition of Poloniex got eventually confirmed. The price tag is supposedly around the $400m mark. - Many are now left wondering what will happen to the dozens of tokens listed on Poloniex once it becomes a regulated ATS (it would not be surprising to see mass delistings). We've raised many of these questions with Circle's management and are expecting some answers in the coming week. We'll post when we get them. In the meanwhile Fortune wrote a great piece on the topic. David Sacks' timing has been just masterful with Harbor (covered in issue #35). After announcing the Regulated Token Standard a few weeks ago, riding the wave of Clayton's testimony and the above SEC probe Harbor is now advocating for a new model to do an ICO in a compliant way by leveraging their protocol: the private ICO (PICO). While the word 'private' will no doubt make crypto-libertarians cringe, it probably is the model that best fits in with the existing regulatory environment as of today. The proposal marries the 'Private ICO' Reg D regulatory framework (Rule 506(c)) with the ability to restrict secondary market enforceable via the compliant R-Token standard. - 9 months later (ie 12 months from issuance) tokens become freely tradable. The only way to enforce such trading restrictions is if the actual tokens are 'permissioned' at the protocol level such that trying to send them at the wrong time or to the wrong address results in an error message. So here is the case for adopting Harbor's Regulated Token Standard. The main practical implication for networks implementing this sandbox is that locking tokens away from regular users for 12 months will no doubt hinder mass distribution. The flip side is that so far most of the early buyers of tokens have been speculators rather than actual users, so perhaps that's not such a big deal and having a stable investor base and a less volatile token in the early year is actually beneficial overall. A class action lawsuit was filed against Coinbase on March 1st in relation to alleged insider trading activity around the addition of Bitcoin Cash to the platform. We covered those events in issue #28. The results of the internal investigation promised by Brian Armstrong himself on December 20th have yet to be released, and the radio silence on that front probably prompted the plaintiff to take action himself. We are seeing the emergence of new governance structures for open-source decentralized networks. Two issues ago we touched on Aragon's new legal structure. This week Dash announced a legal re-org where the company that employs the core development team (Dash Core Group) becomes fully owned by the Dash DAO Irrevocable Trust, a Decentralized Autonomous Organization that is itself controlled by Dash masternodes. Masternodes don't actually legally own shares in the Core Group, but can now vote on its leadership team through the DAO and the trustee is bound to execute their will. The benefits of this structure are that it creates more trust in the network by giving the network itself a direct say on the performance of the core team, while also ensuring that assets and know-how remains within the core team, 'shielded' by a traditional company structure. Nick from 1confirmation is starting to pay attention to crypto collectibles, thinking we might be at the dawn of a boom of similar magnitude to the ICO boom of '16-'17 enabled by the emergence of the ERC-721 standard. An extremely interesting thought experiment with non fungible tokens and bonded curve tokens. In the post, the author tries to imagine a system where a bonded curve token owns a non fungible token, effectively making it fungible again, thus Refungible. Early, and imaginative, but with very interesting implications. A synopsis on tokenised securities 1.0, including the what, why, why nots and how. It is an area where we think we will see a lot of activity. If you think about it, today it doesn't really make any sense that securities are not tokens. as well as listing a few reasons / ways to keep on the right side of the regulations. While the post mainly refers to tokenization of *existing* assets (making the point they are mispriced due to reasons listed above), it does not touch on potentially new types of securites enabled by decentralized technologies, which we find even more intriguing. DPoS is one of the most interesting consensus systems being tried recently. Multicoin has releases a solid document explaining what it is and all its benefits / drawbacks. The one liner is: DPoS is a liquid, representativedemocracy with token holder suffrage. 1/ Still too many different token holders with diverging motives that have no intention of engaging in the network. 2/ Right to perform work for network predicated on token ownership, which in most cases requires initial capital for purchase. 3/ Liquidity of networks can induce short-term thinking. A must read post for anyone in the industry on the nascent practice of token engineering and what it can leverage off from existing fields. Oh boy, where to start. Let me just start you off with a key passage of the article. Almost a year ago in May, Camp bought his first Bitcoin along with 10 Ether, Ethereum’s native token, on Coinbase, a popular online exchange in the U.S. But as he looked to invest further in the ballooning field of digital tokens and alternative cryptocurrencies, he was let down. “The more research I did, the more I was not really wanting to buy a large amount of any one of them,” Camp told Fortune. “I realized it might be better to release a new project from a different philosophical standpoint with cooperation from a lot of universities, scientists, and research institutes—like the Internet,” he said, in terms of its path to development. Someone might very well have created Uber, and be a visionary, but having only bought a Bitcoin one year ago (2017!!) shouldn't really qualify anyone to launch a "competing" currency and consensus mechanism thinking they know what they're doing. This might be a post for another week, as I can't quite frame it perfectly now, but there is something about Silicon Valley and crypto that just does not fit. Talking about the coin, it's a Ripple/Stellar kind of non-sense where there are verified nodes that run the block-building process. Until a year or so ago one would not have imagined that Bitcoin could have been the topic of interest at listed companies earnings call. Jack Dorsey is a true believer and is spreading the gospel to many an equity analyst of Wall st.
"Bitcoin, for us, is not stopping at buying and selling. We do believe that this is a transformational technology for our industry and we want to learn as quickly as possible." The headline is catchy, but Wellington Management for now is just taking equity positions geared to the growth of crypto (e.g. TSMC, AMD, NVDA) and upgrading its systems to enable Bitcoin derivatives trading. This stance could rapidly change though and we would not be surprised to see them taking direct positions in crypto assets by year end. This post goes off a bit of a tangent, but is nonetheless quite entertaining. It explores the idea of disintermediating the display of wealth using Bitcoin and zero-knowledge proofs, instead of relying of signals like Amex Centurions, designer shoes etc that are decoupled from the actual wealth. CEO Mikitani announced that Rakuten's $9B loyalty program will be tokenized into the not so creatively named Rakuten Coin. While the stated goal is to provide a liquid cross-platform cross-boarder loyalty scheme, it seems pretty evident that they are just jumping on the band wagon here. It's totally unclear when it will be released and how it would actually work, in fact why a proprietary loyalty scheme should be on a public blockchain in the first place. Even Starbucks Executive Chairman Howard Schultz is thinking about a proprietary token to integrate into their already massive mobile payment platform (50% of their tender is through the app, 70% in China!). Like it or not, corporate coin season has just started. One to add to the long list of posts covering the MV=PQ equation applied to token valuation. This one is particularly noteworthy as it's authored by a former Research Officer at the Federal Reserve Bank of Minneapolis. His main point is to mind the units of the two side of the equation (they need to be the same, either USD or the economy's output). In a surprising and weird move, Bitpay has decided to go all VISA on non-kosher industries and outright terminate the relationships it had with some customers. I can't really understand any company working on Bitcoin banning sales of any specific thing, so they must have caved to some pressures, but given the 0 risk nature of transactions, I can't understand which. And from a central bank no less. The world is just now recognizing the countless applications of blockchain technology, not to mention the speed, security and simplicity at which transactions can be completed, and Yves Mersch of Luxembourg has suggested he's got something that can run circles around it. Dave Kleiman is a programmer who was somehow involved in the early days of Bitcoin, and even founded a company together with faketoshi Wright. When Wright brought on the clown show of being Satoshi, he said that he invented Bitcoin together with Kleiman. Kleiman's brother is suing Wright for a lot of money, as he estimates that Wright cheated their estate out of 300k-1M BTC. Hopefully we at least are going to get some good early emails or info on exchanges between the two in the early days. Another week another Truffle release. MetaMask is one of the most important tools for the decentralized world at the moment: but it was plagued with bad UI and UX. They've finally gotten to work on their UI which now looks very, very decent - as well as a few UX things. I suggest you try it out clicking on the small menu on the top right. Ujo is stunning, it's one of the few incredibly useful non-finance related protocols. It might still be early for something like this, but it's clearly what will power apps in the future. OTC desk Genesis Trading has launched a crypto-lending business targeting institutional investors (min $100k). Many institutional investors have been playing cautiously or waiting on the sidelines for, among other things, the ability to be hedged by taking short positions. Genesis has clearly spotted such demand. The amount of activity going on, people and infrastructure getting built under the ConsenSys umbrella is truly mind-blowing. Say what you like, they are a powerful engine behind the Ethereum ecosystem. A fascinating retrospective on week 1 since the 'launch' of the Petro. TL;DR: it's all made up propaganda as well as being a terrible investment. "TON is the starting gun for venture capital, and new LP capital (endowments, pension funds etc.) flooding into the crypto markets." We are seeing an increasing number of VC firms that up until a few months ago were lukewarm on crypto at best, now actively hiring for dedicated in-house crypto roles or making a first appearance in crypto termsheets. They have all seen the TON deal, and their LPs have seen it too, and they have all seen reputable firms investing, leaving them with the the taste of FOMO in their mouth. "2018 is about to turn into a big inflationary period for crypto. Put your seat belts on"
This one we still haven't figured out. Remember the big CoinDash disaster where they got their money "stolen"? The hacker now returned an additional 20k ether, no questions asked. It would be really weird if there wasn't anything else going on here, as this makes absolutely no sense whatsoever. The Texas State Security Board has issued a cease and desist letter to crypto investing site LeadInvest due to fraudulent selling of unregistered securities. - expertise from world class management team (made of people with either no association with the project or imaginary ones represented by stock photographs). PBOC crack down on crypto continues, this time threatening to freeze customers bank accounts showing signs of activity linked to offshore exchanges (after having banned local exchanges). China continues to prove the censorship resistant use case for crypto assets. Missed out on this one a couple of weeks ago: the UK Treasury Committee has launched an inquiry into digital currencies and distributed ledger technology, with what seems to be a sensible approach. "Striking the right balance between regulating digital currencies to provide adequate protection for consumers and businesses, whilst not stifling innovation, is crucial. As part of the inquiry, we will explore how this can be achieved." Latest addition to the list of crypto ecosystem funds (keeping track of them all in this Twitter thread). The fund will be managed by Greg Heuss (who worked with RChain founder Greg Meredith in the past), Steve Careaga and David Otto under a newly set up fund named Reflective Venture Partners HQ'd in Seattle, armed with $190m worth of RChain tokens (or 10% of its total token supply, quite material). The listed holding company of Silvergate Bank has sold $114m worth of stock in a private placement than included (surprisingly to many) Digital Currency Group among its participants. This is quite relevant because Silvergate Bank has historically been offering banking services to many fintech and crypto businesses, while most other banks have been playing hardball. With a broad portfolio exposed to the sector, DCG no doubt felt that being close to a crypto-friendly bank was of strategic importance. Sounds like a smart hedge. But, Casa, is a six-month-old startup fthat includes core-contributor Lopp in its team, that is developing multi-sig / custody solutions. Lerer Hippeau, Compound and Boost VC invested a total $2.1 million in the company.